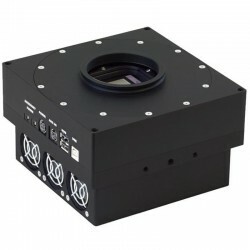 We include custom adapters in an imaging package, complete turnkey imaging solutions to customers, no matter the kind of scope, camera, reducer, guider, or rotator customers happen to choose. The ProLine Imaging System sets a new standard in CCD camera performance and flexibility. As FLI's flagship imaging system, the Proline cameras feature user selectable download speeds, choice of cooling base configurations, and a separate hermetically-sealed chamber for the CCD and electronics. Every major component of the ProLine is CNC machined to ensure a long life in the most demanding conditions. The ProLine base / heat sink, shutter housing and front flange are each machined from a single piece of high-grade aluminium. (Being part of the base assembly, even the ProLine fan cover is CNC machined!) The electrical printed circuit boards use only the highest quality components and are protected from harsh environment without the need for conformal coatings. Breaking new ground in download speeds, the ProLine provides the user with extremely fast user-selectable download speeds. You can download images at 12 mega-pixels per second for focusing. This means that an unbinned image can be downloaded to your PC in as little as 1 second! For imaging, the download time can be slowed to reduce the noise in the final image. The ProLine achieves a sustainable 65°C cooling performance. This means you can operate your camera at -30°C with ambient temperatures of up to 35°C (84°F) for lowest dark current and its attendant noise. No additional cooling or cooling sequence staging is necessary but a liquid cooling option is available to achieve a wider range. Conventional imaging cameras move the image data directly from the image sensor to the USB port, making them susceptible to added artifacts due to PC processing tasks, processor speed, and other PC-related issues. Each ProLine camera has an internal memory capacity so that the imaging chip can be quickly read out and downloaded to the PC. This allows the PC to take the image at whatever speed it is capable of without introducing any artifacts to the image. Through sophisticated design and production techniques, the ProLine image sensor is accurately aligned so that the imaging chip is perpendicular to the optical path without shims or other post-assembly adjustments. This is crucially important as chips get larger to insure the entire frame of your image is in focus. Reaches Operating Temperatures in 5 Minutes!